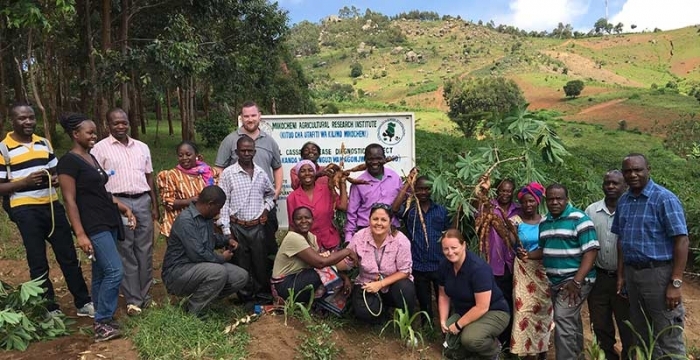 Our research team, The Cassava Warriors, see the food security struggle faced by smallholder farmers in East Africa and, by partnering with scientists in the region, we are certain we can work as a team to solve this crisis. 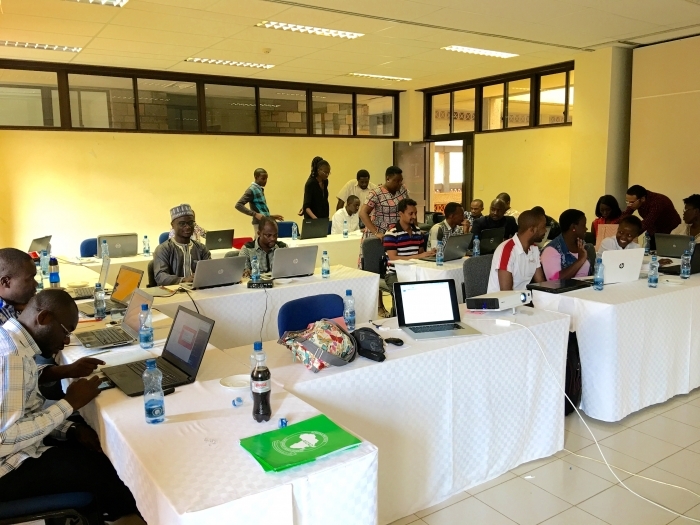 By conducting computational training sessions in Kenya, we will teach scientists to identify pests and diseases using genomic data and pass this information on to small holder farmers, so that they can independently identify the diseases that are attacking their crops. 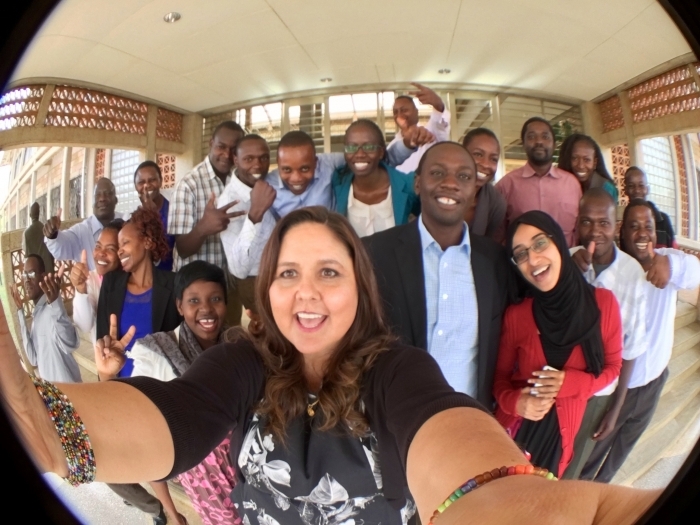 We need your support to fund a bioinformatics training course for young scientists at Eldoret University in Kenya. Sam Muturi (pictured below second from right) at the University has invited us to put on the training. He has 20 students lined up and ready to go. Our team has been working on a variety of projects in an effort to fight the cassava diseases and pests. The African Cassava Whitefly Project and Cassava Disease Diagnostics has the generous support of donors, and our work was featured by The United Nations in reaching the goal of Zero Hunger worldwide by 2030. Funding from our supporters has enabled us to get this far. We recognise that in order to help locals help themselves, we need to provide a transfer of knowledge through training. We have been able to do this successfully in Tanzania and Uganda, however those in Kenya, faced with the same issues, also need our help. What is our research achieving? So far, in conjunction with our international partners, we have been successful in delivering the bioinformatics training to over 100 students. This training is empowering young scientists to handle their own genomic data, which increases independence. We have also developed an online, open source database tool, Whiteflybase that is helping scientists and farmers in East Africa and all over the world identify the species of whitefly affecting their crops. We are helping to improve cassava production and output and motivating young students to become better equipped to continue the research and face future crop threats independently. The transfer of knowledge through training of scientists and smallholder farmers will provide Kenya with the capacity to identify viruses and whitefly species using genetic data and bioinformatics tools. These training programs will be an integral part of the success of the project overall. Our research requires frequent visits to East Africa for training and fieldwork. We visit local universities and farmers. Your donation and support will greatly assist the smallholder farmers and the next generation of young scientists. We are grateful for your generous support in helping our team train and transfer our research to farmers in Kenya. Support travel to East Africa for 3 members of the Cassava Warriors team, to enable them to lead training programs in Kenya. Support facilitation costs for a workshop training for 20 students for 5 days at University of Eldoret, Kenya. Cover the costs of stationery required by participants during the training. Purchase laptops so that trainees have the basic tools required to utilise the Whiteflybase database. Develop training packages and tools that can be transferred to local trainers, reaching those most affected and enabling them to continue the research in the future. Field visits to farmers near Eldoret University. Share this page with your friends and become part of the fight for global food security. Thank you for joining us as we work together with young scientists and smallholder farmers in Kenya to shape the future of food security in East Africa. You will receive a personalised Thank you email from one of our team to thank you for your support to this project. $20 Social Media Shout out! Receive a shout out on our social media or blog page thanking you for your support to this project. Your donation will provide much needed bioinformatics software for our trainees. Your donation will go towards the purchase of laptops for our trainees. Our lead researcher Laura Boykin will present a talk at your function about the research and its progress to date (Perth/ WA based).